Marcelo Bielsa was left frustrated by Leeds United’s defending as three goals in seven minutes saw them suffer a back to back defeat for the first time under the Argentine. Despite being reduced to 10 men with the sending off of Kalvin Phillips Leeds came from one down at half-time to take a 2-1 lead and looked well in control on their trip to Nottingham Forest. But defending, which was brittle at the start, let them down as three gift goals to add to an early one allowed Forest to run out 4-2 winners. He said: “We didn’t lose the control of the game. I would say the opposite, that we could control the game even if we had one player less. “We had a succession of facts and all of these facts were against us. We had to play with one player less. We were a little bit fragile in defence, but during the 90 minutes we did everything to win. “The players did a very big effort. It’s not a new fact that we have problems on set-pieces and it’s also not a new fact that we make it easier sometimes for the opponent to have chances to score. Phillips’ red card for a dangerous tackle means he will now be banned for three games, adding to United’s defensive problems, but Bielsa does not expect to strengthen the back four in the transfer window now open. He said: “We don’t have any problems in defence. If you take out the goals that are scored at set-pieces, we are the team who have conceded the least. “Obviously set pieces are part of defending and we can’t hide the fact we’re lacking good headers like Berardi and Cooper. 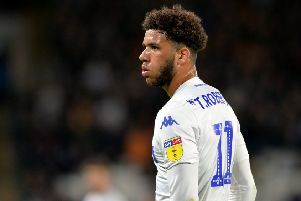 Leeds fans were frustrated that while Phillips was shown a straight red card for a studs up challenge on Adlene Guedioura Forest escaped going down to 10 men in the 13th minute when Jack Robinson’s professional foul on Jack Harrison was only met by a yellow card. But Bielsa refused to criticise referee Darren England. He added: “I don’t think the intention was to hurt the opponent and it’s hard for me to condemn this decision (Phillips’ challenge). “With this kind of decision, even if it’s not prudent, the ambition was to reach the ball. Leeds were left chasing the game after an initial mistake by Adam Forshaw was punished with the opening goal for Forest in just the fifth minute. The Whites midfielder, who had a tough afternoon, saw his underhit back pass swooped upon by Jack Colback , who rounded keeper Bailey Peacock-Farrell to score. Claudio Yacob headed wide from a corner to give an indication of the problems Leeds were to have in the air at the back. But the visitors found their stride and went on to dominate the rest of the half. Forest were lucky as Harrison got in behind their defence only to be brought down by Robinson, who could have been sent-off as the United winger was denied a shooting opportunity by a deliberate foul. Soon after Barry Douglas sent a free-kick just wide while Ezgjan Alioski headed wide and Kemar Roofe was put through only for his angled shot to be directed straight at keeper Costel Pantilimon. Roofe came close again as he looked to get on the end of Alioski’s flick on, but Leeds found themselves down to 10 after Phillips’s reckless challenge got him sent-off and there was no leniency this time from the referee. Forest could have undeservedly doubled their lead in injury-time when Joe Lolley took advantage of another Forshaw error to race clear only for Peacock-Farrell to be out well to save. Bielsa surprisingly went for a back three in the second half with Forshaw taking his place in the defence and youngster Jack Clarke brought on to play right wing-back. It looked to be working as Pablo Hernandez saw a shot beaten away by Pantilimon then Clarke came up with an equaliser after being put clear by Mateusz Klich. Leeds were running hot now and Roofe got onto a ball over the top only to see his lob over the keeper drift just wide. They made it 2-1 when Hernandez’s cross to the far post was headed back by Pontus Jansson and volleyed home from close range by Alioski. However, the lead was only to last five minutes with Colback lashing home in a crowded box after a corner was not cleared. Clarke came within a whisker of another goal for United a minute later with a great curling effort, but it was 3-2 to Forest when Daryl Murphy headed home from a corner with Peacock-Farrell caught out positionally. It got quickly worse for the visitors as hesitant defending by Luke Ayling was punished by Ben Osborn, who ran on and curled a fine shot past Peacock-Farrell. Still Leeds kept attacking with Roofe clean through only to see his shot beaten away by Pantilimon. Robinson almost headed an own goal as he met a dangerous cross and was lucky to see the ball bounce off the post. Jansson headed wide from a corner and United really knew it was not their day when Roofe headed a good chance over in the 90th minute. Forest: Pantilimon, Darikwa, Hefele (Guedioura 5), Fox, Robinson, Yacob, Colback, Lolley (Osborn 65), Carvalho, Cash, Murphy (Appiah 90+4). Leeds: Peacock-Farrell, Ayling, Jansson, Phillips (sent-off 41), Douglas (Roberts 48), Forshaw, Alioski, Klich, Hernandez, Harrison (Clarke 45), Roofe.